Grandmother’s Welcome Audio Message below. See The Playwright’s Backstory, Sandra H. Rodman. Spontaneous, impromptu, unedited, recorded-transcribed just as received the first time. See Classes – and Private Sessions for new Events. Impromptu, unedited, improvizatiional interdimensional communication as it comes. Or Sci-fi? Or higher creative intelligence? Directory of all Grandmother from Another Planet Audio / Blogs, And “Guide Posts” of more guided messages, Book Lists. Who Is Grandmother? A Welcome Message from Grandmother from Another Planet. Grandmother from Another Planet — a new experiment in higher creative consciousness and interdimensional communication, by Playwright/Author, Sandra Rodman, creator of Right Brain Aerobics, and meditation programs such as Star Talk, Ancient & Future Lineage Paths, Stargate Meditations and other seminars; former Fortune 500 executive in technology innovation. Overview: While in deep meditation, unusual wisdom or communication from an internal “guide,” Grandmother from Another Planet, seem to be available by asking questions aloud…accessible spontaneously, verbally, in a very slow voice (not like my own and a different accent). Discovered accidentally in March 2017 — using a Right Brain Aerobics technique, “Inner Genius Q&A”…or “Your Inner Yoda Q&A” … adapted for deeper improvisaational intuitive speaking dialogue — playwrighting “on the fly,” unedited? Or intuitive accessing of a different psychology or aspect of personal consciousness? i had no evidence of being able to do interdimensional or intuitive communication or automatic/spontaneous writing until my 60’s, using deep meditation and sound — so it is likely that all of us can do this with different mental focus. Recordings are spontaneous, informal, just as they come in, using iPhone, and unedited. Yet I do not write or speak this way at all. The voice and messages are calming, seeming to slow down in time to “tap inner wisdom.” I have no idea what “Grandmother” will say beforehand. All of it is a surprise to me. A kind of “intuitive interdimensional improv communication“? Or improv theater/playwrighting of a new kind? Or “interdimensional direct communication”? Below: Audio Greetings from “Grandmother” for this website: Learning to be beings of “light communication”? 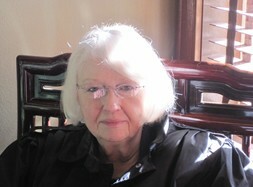 Greetings and Backstory from the Playwright/Author, Sandra Rodman — See Playwright’s Story, Bio Links). GRANDMOTHER: “I Welcome You…to explore the infinity of your nature as if it were essential to the beating of your heart. “These messages encourage you to focus on your mission of ‘light’ or message of ‘light’ — with that emphasis on ‘light’ and ‘light languaging,’ the expansion of human consciousness — because this is the period of Earth’s development in which you must “develop” as a higher creative light intelligence! “When you express ‘light meaning,’ there is a reverberation throughout human consciousness — and a reverberation which affects the physical and psychological state — the very atoms, electrons, and protons — of the individual to whom you are speaking, to whom you are communicating. Even if you are communicating with written words or words on the ‘internet,’ the web of communication — this will be recognized as ‘light languaging,’ because the identity is engaged. It is engaged with the possibility that you might become a new being of communication. I want to stress that: A new being of communication. “Your experiments with media will grow vaster and vaster — as prompts, as stimulation for you to become a new kind of communicating human. “That humans speak in a language is one step of awareness and soul growth. That humans begin to speak in a light language as a ‘light being’ is another step of evolution of communication — which is nothing more than an interaction or an expression of interconnectivity, of Oneness. “As a light being, you can communicate within that flow; you can communicate with language and symbols which have a different wave length, a different sensibility.